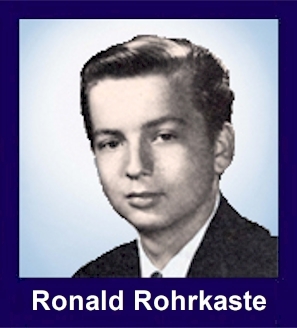 The 35th Infantry Regiment Association salutes our fallen brother, PFC Ronald Edward Rohrkaste, who died in the service of his country on February 9th, 1968 in Quang Nam Province, Vietnam. The cause of death was listed as Small Arms/AW. At the time of his death Ronald was 20 years of age. He was from Edwardsville, Illinois. Ronald is honored on the Vietnam Veterans Memorial at Panel 38E, Line 59. The decorations earned by PFC Ronald Edward Rohrkaste include: the Combat Infantryman Badge, the Bronze Star with V, the Purple Heart, the National Defense Service Medal, the Vietnam Service Medal, the Vietnam Campaign Medal and the Vietnam Cross of Gallantry with Palm Unit Citation. Ronald is buried in Bartlett Cemetery in Pin Oak Township (Madison County), IL. For heroism in connection with military operations against an armed hostile force in the Republic of Vietnam. Private First Class Rohrkaste distinguished himself while serving as an Infantryman with Company C, 1/35th Infantry. On 9 February 1968, Company C was conducting a search and destroy operation a few miles west of Hoi An. As the forward element cautiously moved through a small abandoned village, it was subjected to intense hostile automatic weapon and recoilless rifle fire from well-concealed positions in the village. Private First Class Rohrkaste reacted immediately, placing effective return fire on the hostile positions. He maintained fire superiority long enough to allow his comrades to maneuver into effective positions safely. The enemy, recognizing his effectiveness against them, launched a ground assault on his position. Private First Class Rohrkaste courageously maintained his position against the advancing enemy. He eliminated several of the enemy soldiers, causing the remaining hostile elements to withdraw to a trench line complex nearby. Seeing several of his comrades injured and lying in the open, Private First Class Rohrkaste again exposed himself to the hostile fire to reach the wounded men. After checking their wounds, he moved them to safety. As he brought the last wounded man to safety, he was mortally wounded by hostile small arms fire. His efforts contributed immeasurably to the successful defeat of the hostile assault and clearly prevented more serious casualties. Private First Class Rohrkaste's personal bravery, concern for the welfare of his comrades, and exemplary devotion to duty are in keeping with the highest traditions of the military service and reflect great credit upon himself, his unit, and the United States Army.